Edible Cookie Dough for the Win! Need an Easy Dessert? Choose This! This Edible Cookie Dough Recipe is my favorite dessert recipe to bring to parties! A small bite goes a long ways because they are so right, yet the cold chocolate chips give you the perfect crunch to keep you coming back for more. Edible Cookie Dough for the Win! We are huge fans of dessert at the Sorensen house, there’s no doubt about that. 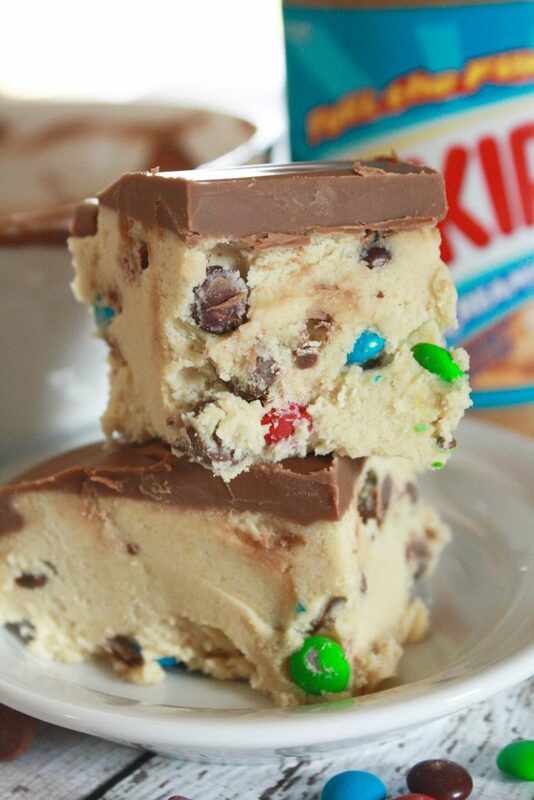 And, hands down, the number one favorite dessert recipe in our home is edible cookie dough bars. 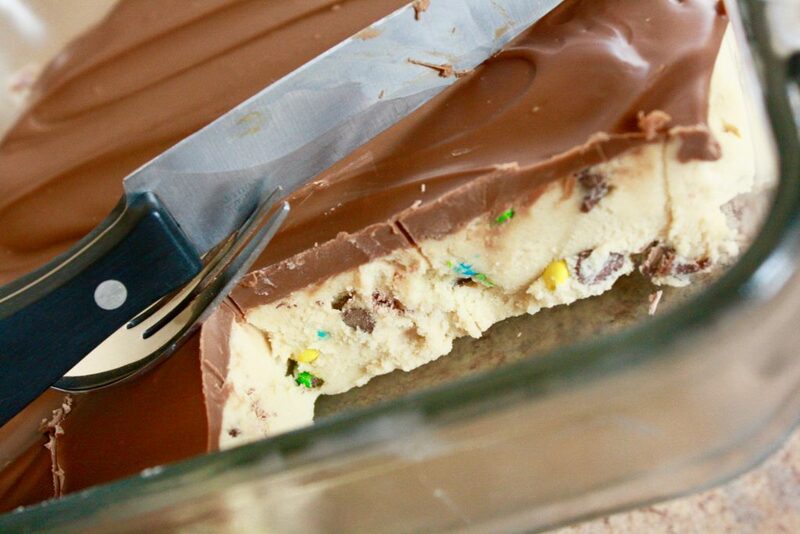 The first time I ever tried this delicious cookie dough bar made in Heaven concoction was a couple years ago to take to a friends house as the dessert. She was making the dinner and I had one job, the dessert. 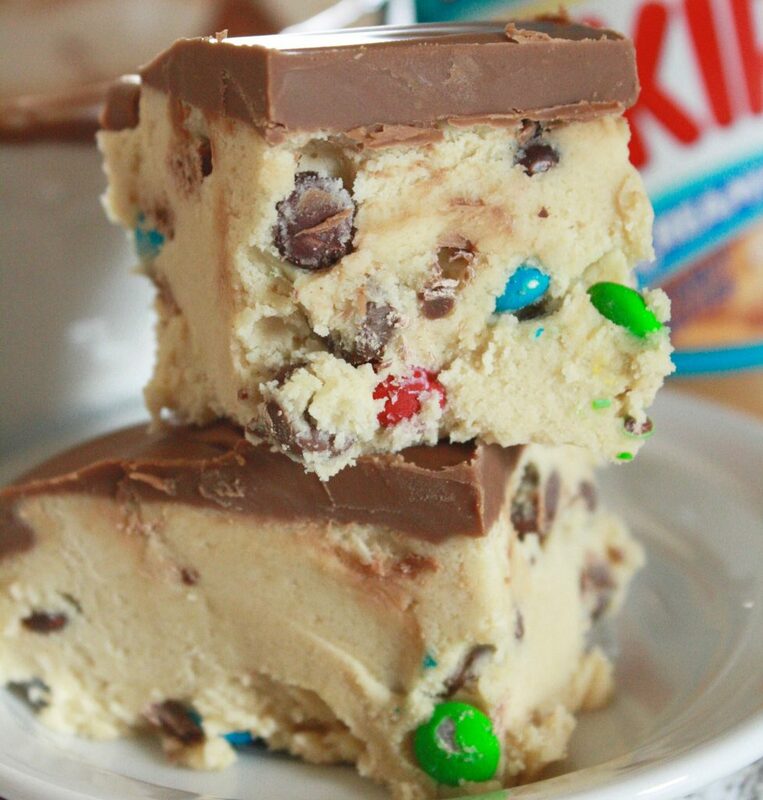 And, these edible no bake cookie dough bars absolutely killed it. I am a huge fan of easy desserts. We live in a go, go, go world, and therefore, a meal or a dessert that whips up in a short amount of time soon bubbles up the list to the number one spot. And, that’s probably how this cookie dough recipe keeps ending up on the menu. This is a great dessert for showers, and also a great dessert for tailgating. I promise everyone will love this no egg cookie dough! Is eggless cookie dough safe? The big debate though is how do you make an eggless cookie dough that is safe. And, then all of a sudden (it seemed) that flour became that naughty food culprit. And, it’s true that flour isn’t safe to eat raw. I have read that the easiest way to kill the bacteria in flour is to put it in a large glass bowl and microwave for one minute and 15 seconds, stirring every 15 seconds to kill the bacteria that grows on the grain plant that the flour is derived from. You can read more about cooking raw flour to kill bacteria here. I 100% recommend this practice, as we have to be safe with our food. So, not only is this eggless cookie dough, but this is also baked flour cookie dough. There you have it safe, safe, safe to eat and oh, so delicious! First, you’re going to want to mix your initial ingredients in the mixer. Include your softened butter and brown sugar. Whip that until it’s fluffy (I couldn’t live without this mixer ). Next, add in your vanilla, until combined. Add in the baked flour and sweetened condensed milk, not all at one time to be sure you can still mix it up well. Let that hang in the mixture for a little bit to get nice and well blended. 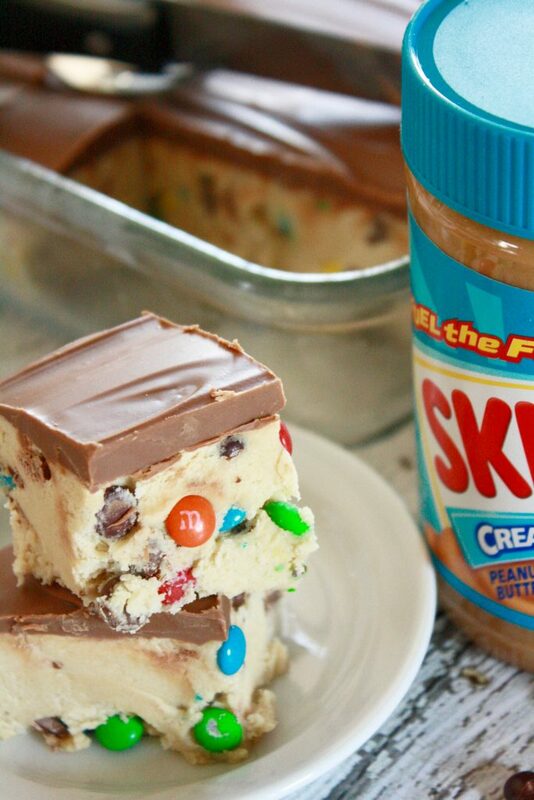 Using a spatula, mix in the chocolate chips and m&m’s. You can probably already tell this is going to be Heaven on earth, right? Right, it is. Line a baking dish with parchment paper. I love using parchment paper, and would even venture to say that I use it more than aluminum foil. This is my favorite dish to make these in and it’s even on sale! Cover your bars with foil and freeze for a couple hours. Once the bars have been in the freezer for some time, you’ll want to make the frosting, a simple mixture of peanut butter and chocolate. If you’re not a fan of peanut butter, or you are working with allergies, leave it out – no harm, no foul there. 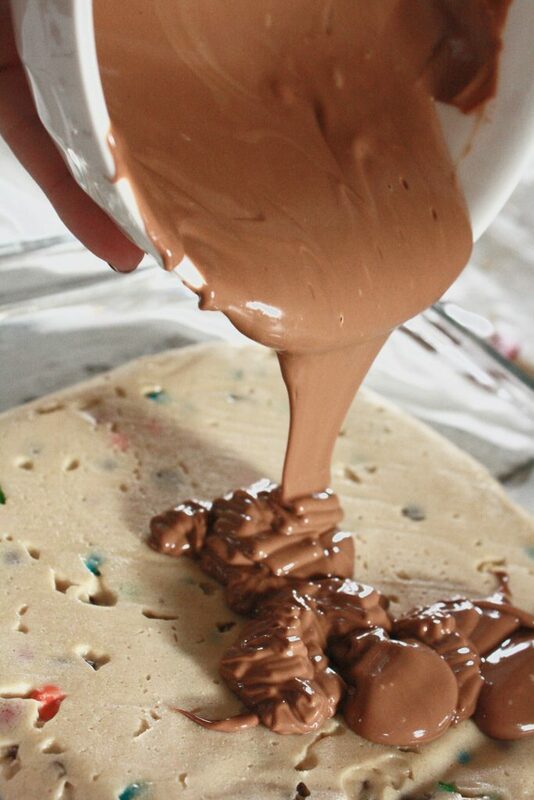 Once your chocolate topping mix is made, remove the bars from the freezer and spread the topping over the cookie dough making it nice and smooth with the spatula. Put the foil back on and freeze, allowing the topping to harden for about an hour. 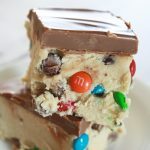 This chocolate chip cookie dough bars recipe couldn’t be any easier and everyone absolutely LOVES them! 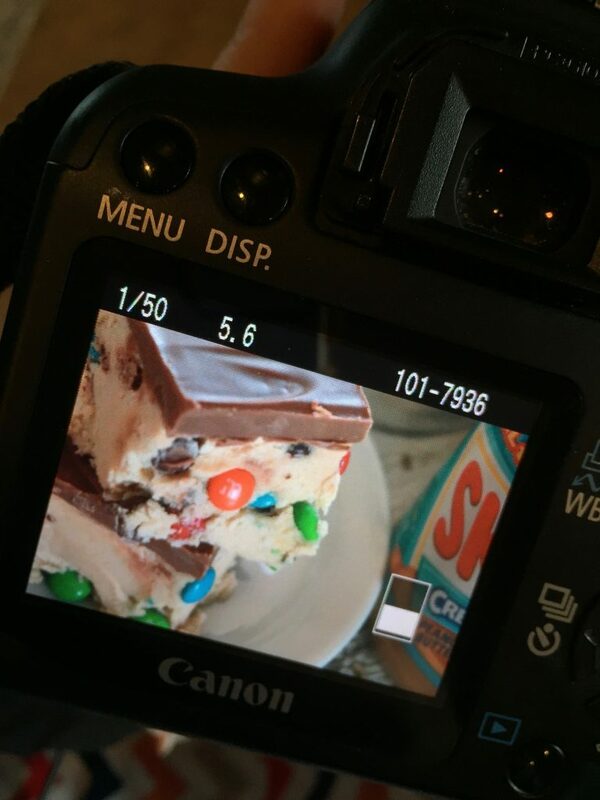 This is a great dessert to take to a party! ** Please note that they will get soft if they sit out for too long. I recommend using a sharp knife so you can cut them well if they have started to thaw out too much, but they’ll still be able to be picked up and eaten as cookie bars, as the cookie dough is stiff. 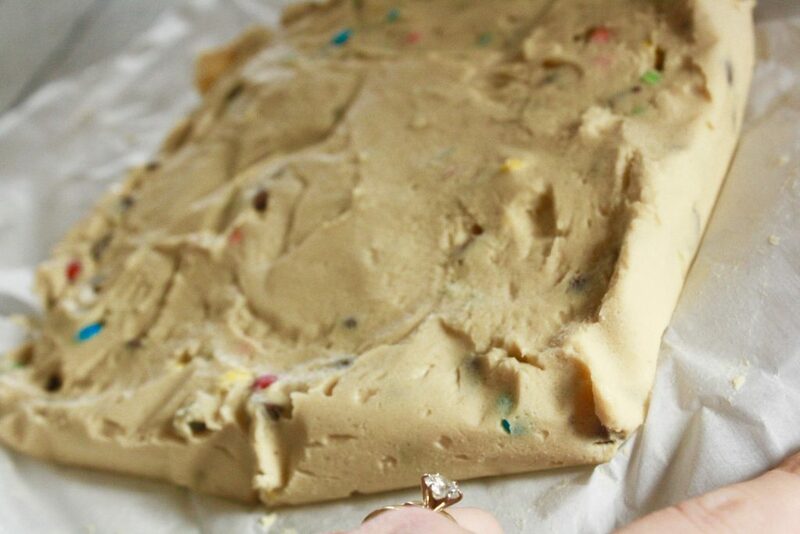 This Edible Cookie Dough Recipe is my favorite recipe to bring to parties! A small bite goes a long ways because they are so right, yet the cold chocolate chips give you the perfect crunch to keep you coming back for more.